Once upon a time, ladies’ watches were mostly equipped with quartz movements, while mechanical options tended to be reserved for the men. Fast-forward to today, however, women are no longer satisfied with simple, gem-set, battery-powered watches. Instead, we desire a mechanical timepiece that not only looks fabulous on the wrist, but also comes with a technically complex movement that we can appreciate and admire. 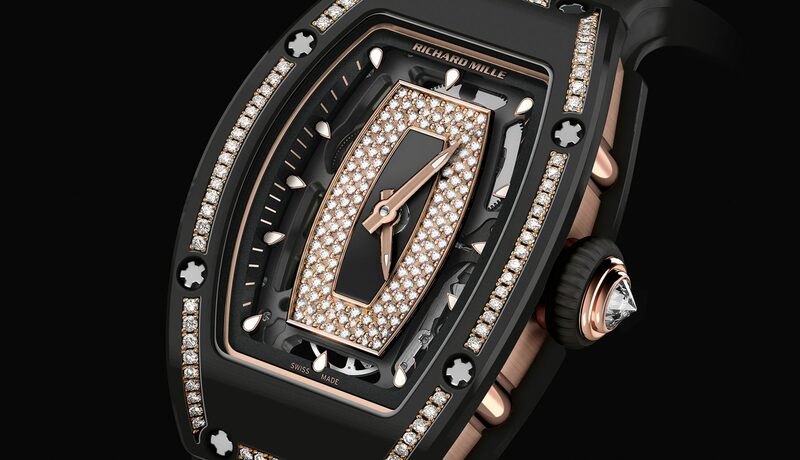 Swiss watchmaker Richard Mille has always demonstrated a special commitment to female watch lovers with its wide range of beautiful timepieces, which, unlike those that are simply smaller versions of men’s models, are all created specifically for female wrists. For 2018, the watchmaker continues to illustrate such dedication by extending the ladies’ collection with a brand new version of its RM 07-01 timepiece, which has just been revealed ahead of its debut at Salon International de la Haute Horlogerie (SIHH). Richard Mille just revealed a brand new version of its RM 07-01 ladies’ timepiece, ahead of its debut at SIHH 2018. This new RM 07-01 model features an exclusive gem-set black TZP ceramic, which not only provides exceptional hardness and scratch resistance, but also possesses an extremely fine-grain texture (achieved through a long and delicate process of milling and micro-shot peening) that gives a perfect matte effect. Every inch and angle of the bezel and case bottom has been carefully hand-polished to further showcase the complex shapes of the timepiece. The diamonds, meanwhile, all measure 0.25mm and are in brilliant cut set in red gold prongs. Every stone has been carefully chosen for its exceptional clarity, and then polished one by one to achieve a harmonious shimmer, so that they all sparkle spectacularly against the velvety black of the ceramic. As for the movement, this new RM 07-01 has been installed with an in-house automatic Calibre CRMA2, assembled on a baseplate with bridges crafted in grade 5 titanium. Its variable-geometry rotor, meanwhile, is created in 18-carat 5N red gold, which allows the speed of recharge to adjust according to the activity levels of its wearer. A ladies’ timepiece that merges both technical brilliance and contemporary refinement — we can’t wait to see it up-close at its official debut in Geneva next month.